On the June 19, 2013 the IXV Descent and Landing System Test was successfully performed off the east coast of Sardinia, Italy, at the Poligono Interforze Salto di Quirra. Getting a spacecraft off the ground is hard enough, but sometimes getting it back to Earth again is even harder. But a prototype for a new European reusable spacecraft is a step closer to its first space mission after passing a milestone test flight last week. The European Space Agency (ESA) has successfully launched a series of robotic vehicles to orbit, including four cargo freighters that have delivered supplies to the International Space Station. Those spacecraft, however, have all been purposely burned up in Earth's atmosphere on their return trips. 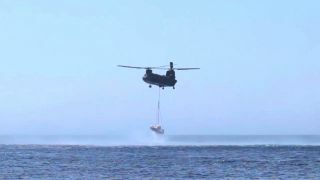 On 19 June 2013, the Intermediate eXperimental Vehicle successfully completed the descent and landing system test at the Poligono Interforze Salto di Quirra off the east coast of Sardinia in Italy. As it fell, the vehicle picked up speed to simulate the velocities it might experience on a return from orbit. Eventually, the craft deployed a parachute to slow its speed for a safe splashdown into the water at less than 15.7 mph (25.2 km/h, or 7 m/s). This last step in a series of tests shows that IXV can be recovered safely after its mission into space," ESA officials wrote in a statement. Eventually, the agency plans to equip its unmanned spacecraft with the IXV re-entry technology so they can be recovered at sea. This allows astronauts to send cargo back to Earth, such as completed science experiments for analysis, and failed equipment for inspection. The test flight involved a complex choreography of steps to enable the safe landing. After the IXV's parachute was deployed, two heat shield covers were cut off from around the parachute and 16 nonexplosive actuators were fired to release the panels covering flotation balloons to soften the vehicle's landing. Then beacons were deployed communicating the craft's position, and engineers received a signal via satellite of the IXV's position, bobbing in the water, enabling it to be recovered and taken to land. Most of the test steps apparently went smoothly, though engineers are investigating an anomaly that occurred in inflating the balloons. "This test highlights the importance of early in-flight verification to secure a robust space vehicle design, confirming the technical direction and possibly suggesting further improvements," officials wrote. Next year, engineers are planning to test the IXV from an even greater drop height. The vehicle will be launched on Europe's suborbital Vega rocket to the edge of space, where it will re-enter Earth's atmosphere as if returning from an orbital flight. This time, the IXV technology will have to protect the craft from re-entry beginning at hypersonic speeds.